Music plays a very crucial role in our lives. Apart from providing the much needed entertainment, music is a very strong vehicle for disseminating different information, for example, health. And just like football in sport, music will always remain instrumental in spreading different messages to the masses. This is why the country’s former Big Brother Africa (BBA) representative Code Sangala, better known as C.O. in music circles, decided to use music to fight one of the deadly diseases – Malaria. Having noticed that the disease was not being given much attention despite killing a lot of people, Code who was once attacked by the disease and nearly died, decided to use his musical talent to fight the disease. He realised that music is a strong weapon which could be used in the battle against malaria and so he did not hesitate to create an initiative, known as Music Against Malaria. Through the initiative last year, Code hosted different shows to raise funds to rehabilitate the children’s ward at Queen Elizabeth Central Hospital in Blantyre, and now he has taken it a notch further; Music Against Malaria has been expanded into a Non-Government Organisation (NGO). Key facts from World Health Organisation (WHO) puts it clearly that malaria is a life-threatening disease caused by parasites that are transmitted to people through the bites of infected female Anopheles mosquitoes. The disease is preventable and curable but dangerous, and because it is given little attention with little or inadequate resources in hospitals, it has ended up claiming lots of lives including children. According to WHO, in 2017, there were an estimated 219 million cases of malaria in 87 countries and that the estimated number of malaria deaths stood at 435 000 in 2017. The WHO African Region, according to WHO, carries a disproportionately high share of the global malaria burden and that in 2017, the region was home to 92 percent of malaria cases and 93 percent of malaria deaths. “I nearly died because of malaria and that gave me an idea that I could use my musical talent not only for entertainment but for a good cause and that is to fight the disease through raising funds to buy drugs but also rehabilitate wards, especially children’s wards. I am happy with the progress we have made as well as the support we have received from different institutions,” Code said. The former BBA representative, who used to star with Ndirande-based group Kapirintiya before turning solo, said there is so much that creative players can do with their talents to assist in different initiatives, such as the one he is involved in. He said Music Against Malaria will continue to use the art form of music to drive fundraising campaign to raise funds to refurbish pediatric, accidents and emergency department of district hospitals in the country. “Our mission is to contribute towards the improvement of the health sector in Malawi. We seek to bridge the gap between government intervention and the donor community on health issues,” Code said. 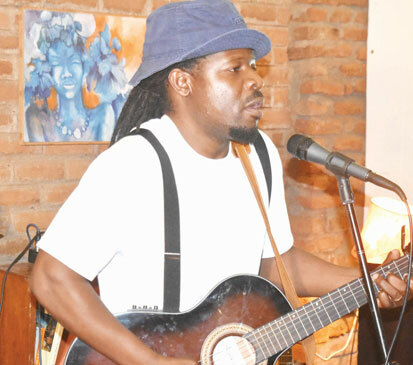 Code, who is also the host of Sounds of Malawi Acoustic session at Jacaranda Cultural Centre aimed at propelling Malawian music, recently partnered singer and guitarist Annemarie Quinn, who is from United Kingdom. “I saw that this was a good initiative. Music, just like sport, is a very powerful weapon for spreading different messages and so I did not hesitate to partner with Code Sangala. I am happy with the progress we have made so far and we are looking forward to doing more,” Annemarie said. And for Annemarie, it has been a learning curve as the initiative has allowed her to work with other Malawian artists to create songs with mature messages. The musician, who has had the experience of performing in different festivals in the country, including Tumaini which takes place at Dzaleka Refugee Camp in Dowa, has also seen her creating some songs in vernacular. “This initiative is not only about raising funds to fight malaria but also using music to raise awareness on malaria. We are using music to promote doable actions for prevention of malaria. We are also using music to offer a platform for communities to reflect on malaria,” she said. And having held several fundraising shows across the country attracting impressive audiences, Music Against Malaria has expanded its base in the fight against the disease by creating a festival that, according to Code, would be annual. “We are just trying to do more…Add to what we have already created and we thought having a festival is something that would help in raising funds but at the same time, raise awareness on malaria. We are also looking at the festival as a hub to promote arts and culture,” the ‘Tithana’ song creator said. He said they will be holding the festival on the weekend of World Malaria Day, which falls on April 25 2019. “However, in 2019 we will be holding the festival in June. This is because we had not done some of the things by the weekend of World Malaria Day. We know there are so many festivals around but this is unique in its own way; this is all about singing for a better health and fighting malaria,” Code said. The festival’s venue is Chez Maky in Blantyre. In collaboration with corporate partners and other local and international artists and performers, Code, said they will work with different stakeholders in order to drive home the messages on malaria prevention and treatment as well as raise funds to refurbish pediatric wards in districts hospitals. 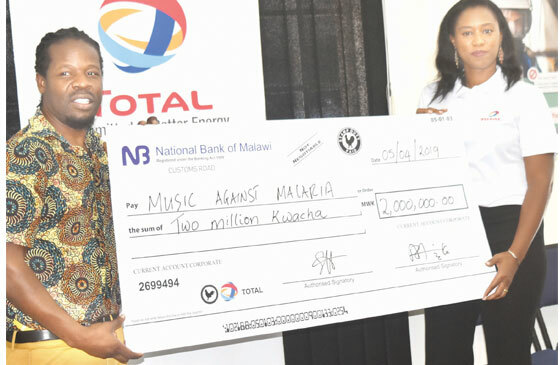 Total Malawi is one of the companies that has been forthcoming in assisting Music Against Malaria with funds and they have come in time and again, showing their commitment towards supporting such initiatives but also arts and culture. With the creative industry sidelined and not getting enough support from the corporate world, Total Malawi has pumped in K2 million towards the 2019 festival. Total Malawi has been instrumental in supporting different arts and cultural events; among them is the French Schools Drama Festival. The company’s Managing Director, Salamata Ball, said Total Malawi is very committed in supporting different initiatives in the communities they operate in. “This is a principle of Total Malawi. We are happy to work with Music Against Malaria. We worked with them in their previous projects where we pumped in K3 million and now for the festival we thought we should pump in K2 million. We feel this is a great initiative,” Ball said. She said apart from playing a crucial role in fighting malaria, Music Against Malaria initiative is there to promote arts and culture. “The money they will realise during the festival will also go a long way in raising funds which will be invested in Chikwawa District Hospital for the refurbishment of the children’s ward. So we are happy to be part of this,” Ball said. She added that they were committed to assist arts and culture because they operate in more than 130 countries where culture is valued. “In the communities we operate, people are driven by culture and so we are also driven by their culture and we understand their identities. We understand communities and so we plan and mix with all these communities to speak with one voice,” Ball said. She said every nation is known by its culture and hailed Music Against Malaria for spearheading a festival that is all about promoting and preserving the country’s heritage. For now, Music Against Malaria has taken a right direction in creating a bigger platform in the fight against malaria but now the challenge is sustenance as well as giving out the best and being different from other festivals. It was all but easy for Music Against Malaria working on shows but having spread their wings to a festival – they will surely have to dig deeper to come out with the best and at the end of it all, win the battle to silence malaria. Tom Sangala – who has written 3248 posts on The Times Group.